Remember a whole month ago when I told you I wanted to implement a daily schedule for our family? Well, I finally got around to doing it. I am a huge proponent of schedules & routines. Kids thrive on routine but what that routine looks like for each family can be different. If I just let her play and run wild she still gets hungry around the same time and tired around the same time so, for our family, it is easier to just have a schedule, so we can plan our days. I know different parents have different philosophies, so no judgement here, this is just how we are parenting and what we are deciding to do. So, grace all around, okay? The best parenting advice I've ever gotten is to start as you intend to finish, meaning decide what you want your family life to look like in the future and train up your children in that way. "Train a child in the way he should go, and when he is old he will not turn from it." Proverbs 22:6 If I want Reese to be able to unload the dishwasher, clean her room, make dinner or bring in the groceries, I can't just wait until shes 12 and ask her to start then. I need to be having her help out starting even now. We want our kids to see how important a relationship with Jesus is, and to start the day with Him. We want our house to be a place where family & teamwork are important. We want our kids to be contributing members of our family through chores and to take pride in this. We want our kids to be sociable. We want our kids to be active. We want our kids to be able to play alone and use their imaginations. What I love about this schedule besides that I wrote it is that it allows for flexibility based on day. I could have written "ish" at the end of every time because we wont be strict exactly to the times, but we did want a general and close idea. During the free times I want Reese to be able to just play in her playroom maybe listening to kids music while I do some general home maintenance. We'll have breakfast around 8am where we will also do our family devotional time and practice our memory verses. We use Truthcards and I love them. Although Reese cant repeat the verses to me, she'll be able to repeat some of the words on the front of the flashcards. And this is just a good bases for her to hear these verses and eventually we'll be able to work on specific memory verses. Family chores means Reese will help me do whatever "chores" I need to get done. For example, my 5 year old nephew unloads the whole dishwasher by placing dishes on the counter and putting away all the lower items. Eventually, he'll be tall enough to put all the dishes away. I want Reese to be able to do this, too, so yesterday when I was emptying the dishwasher, I took all the knives out of the silverware basket and then I put the silverware basket on the floor. I asked Reese to hand me something and when she did I put it away and praised her "Yay! (clapping!) Good job! You are such a great helper!" Our out of house activity will vary from day to day. Some days we will be going to play group or a play date, and some days we will go to storytime at the library. I'm looking into another class for Reese either music or gymnastics or swimming or something like that. Some days it will be errand running or grocery shopping. Some days we will just walk down to the park. It doesn't matter, as long as we get out and about. I've decided that naptime is when I will do the things I need. Blogging, email answering, cleaning, SHOWERING??? or allowing myself a tv show or some reading time. I got the idea for Tot school from 1plus1plus1equals1 and the idea of intentional play from my sister & my sister in law. Basically, I'll have a few activities planned for Reese where she is learning something. I went out and bought a book with 100 easy children's words, a paint with water book, some coloring books and crayons, play-doh and puzzles. I can combine this with learning toys we already have like blocks and stacking rings for some intentional learning play with Reese I'll be intentional in the words I choose as we play "Reese, lets stack the blue blocks on top of the red blocks" or "lets paint the sun yellow. What other things are yellow? Bananas are yellow.. can you say banana?" I want to be clear that if Reese wants to move on to play with something else I will of course be letting her. We will just switch our intentional play to whatever other objects she is interested in playing with. Most importantly I wanted specific time that I could be really intentional in working on fine motor skills, colors, shapes, etc by playing and maintaining a constant dialogue. We've always thought about homeschooling, so this is a good start. After dinner, we will just have free play while we do the dishes and hang out as a family. Our bedtime routine is the same routine she had when she was a newborn and the same routine she will have growing up. Eventually, of course, she will be bathing and reading to her self, but it was important that we started good sleeping habits now so everyone in this house could sleep she could start out early. Makes for a happy baby AND a happy mommy! So, that was all sorts of long winded, but I told y'all I'd blog our schedule once I had it, and so I did. Anyone else keep a routine or schedule with their children? Or have you found something else that worked for your family? Also, any ideas for tot school are much appreciated so feel free to leave a comment with advice! It is great to see you are being intentional with your play and communication. Talking about the activities and routines that you are doing, as well as expanding on her words/ expanding concepts into different types of sentences are SO SO useful in developing strong communication skills! Love this schedule. I think it's great that you'll lenient in times and activity, but still have a frame of what your days will look like. I really like the idea of intentional play, too. I'm going to pin this so I have it to read again when my son is a little older. Love the idea for tot school, please share how it goes and what activities you use! Ashely, this is awesome! I love all that you are doing with 5oh Baby! The intentional play activities (tot school) is GREAT! So important!!! I love how you're putting it out there without bragging, but also to be an encouragement to other moms as well as an example. =) Keep it up. This is super helpful and encouraging. My little guy isn't quite ready, age-wise, but it's good to look towards what will help him as he gets older! And I needed a kick in the pants to put a little more structure in place, so thanks for that :) I love that you and your hubby decided this stuff TOGETHER. You're both parenting, not just mom. That's an awesome example. I love it!! Our schedule are almost exactly the same! I started with Isaac yesterday on an abbreviated schedule (we'll be implementing the whole thing starting on Monday) and it went really well! I think we'll be focusing on one specific Bible story each week and each day we'll do something different: color a picture that's related, play with a puzzle or toy, etc. while I read to him out of the Storybook Bible. And I'll always have a verse. And I LOVE truthcards!! They are fabulous. We'll also be focusing on one color and one shape each week too. Oh and the chores. I couldn't agree with you more. My husband started him unloading the dishwasher several months ago and he LOVES to help. He's also been helping me put apples and oranges in the fridge drawer and put folded clothes away. It's fun for them and it gets them used to it for when they're older. Love this! I'm a schedule-lovin mom as well! Luke goes to bed so easy at night and I attribute that to his bedtime routine we started from thr very beginning. Thanks for posting a link to the truth cards - I have been looking for something like this! Can't wait to see how tot school goes - keep us updated! I have a friend who runs a daycare in her home and uses that forum to teach her little students. One thing that she does that has really worked is assigning every day a different letter. For example on letter B day they look for B items, eat B food, and do arts with the letter B. Just wanted to throw you that idea. It looks like you have a great plan! Such a fun age to start doing "school". Good for you! I never had a 'real' routine for my boys, but my oldest started Pre-K this week and we have started a routine of breakfast, school, and bath/bedtime. I have asked myself everyday this week why I didn't do it sooner!?! With one child gone for 3 hours a day, and then both boy in bed by 8:30 I am really enjoying the 'me' time which was very much needed! I love that you are setting a routine! IT will do wonders for when she is ready for school! 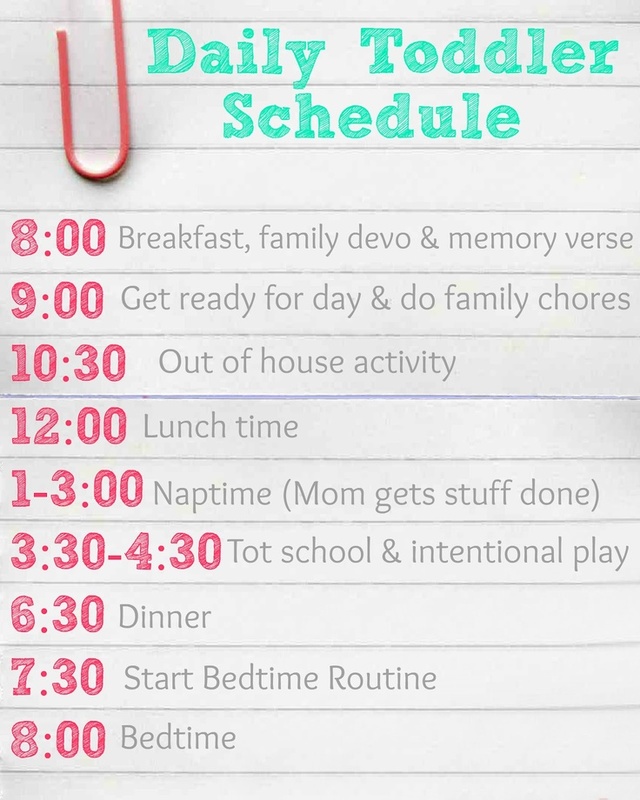 It's hard to keep to an exact schedule (especially once you have more than one child- different stages and needs and all that), but I think it's good for everyone to have at least an outline of how your day normally goes. I also love your little graphic that you made of your schedule! Love it..... some parents don't understand or know the importance of a routine! It seriously makes everyone's life better! .... and plus, when the child is in school they will understand what is expected which makes for a good transition! This is awesome! We do have a similar routine and it makes life a millions times easier! And it's great for when you have a sitter or dad is home for the day to have the same thing everyday so it can just hang on the fridge and everyone knows what is coming up next. My toddler (almost 2) helps me empty the dishwasher. If you are not too ocd, then they try to get her to put her clothes away or "help" fold the washclothes. We also play with dry beans and noodles... hello 1 hour of quiet pouring and sorting and playing!! Get some measuring cups, spoons and any other fun kitchen utensil and let them go at it. I save mine in old formula containers for the next time!! I soo wish I could have a better organized routine! I hope some day my work life wont be so hectic so that I can. Loving your blog. I am a total type A routine needing person so I love this post. You always wow me with your mom skills. My family always had routines and schedules like this, and I think it's a big part of who I am now! I used to think homeschooling was weird, but as time goes on, I'm beginning to think that it's the only option. My sister and my sister-in-law homeschool my nieces and nephews, and the kids are turning out brilliantly! Love this - thanks for sharing! I've been wanting to make some kind of a schedule for us too, but I never get around to it, and I do kind of like being able to come and go as we please without being tied to a schedule. But we desperately need a schedule! This is crazy helpful - 1, to inspire me to actually DO it, and 2, give me some ideas on how to make one! Naptime is when I get all my things done too! We also have family scripture study in the morning. Love having a schedule!! I just found your blog post about scheduling and I'm wondering how you're sticking with it? I'm having a hard time coming up with something that we can stick with. Also, what is your "out of house activity"? I need to look up more about intentional playing too, I think my 6 yo and 4 yo would benefit from that. I was about to respond with "now i have two kids so my routine is different" but then I looked and, nope.. its still the same! I think this routine is super easy to follow because there is so much give to it. As far as out of house activity, it's different every day. Mondays we do gymnastics, tuesdays we grocery shop, wednesdays we do library story time, thursdays I usually work so she goes to the park with her sitter or plays in the back yard, and fridays we try to do a play date. I definitely want to add the out of house activities to our schedule! I think that would benefit my kids and ME! P.S. Can you tell me if I still show up as a "no reply blogger"?